I’ve been keeping my eyes open for a new style to go with and fell in love with these funky woven stockings from One Kings Lane. I decided to try and achieve a similar eclectic look using those woven blankets you can always find at the thrift store, whatever extra scraps of fabric I already had on hand, and some inexpensive trim. My local Goodwill had so many blankets to choose from, I was actually able to find two with similar colors and winter themes. Score! Step 1 – Make your template. I chose to go with dimensions of 9 1/2” wide and 22 1/2” long. 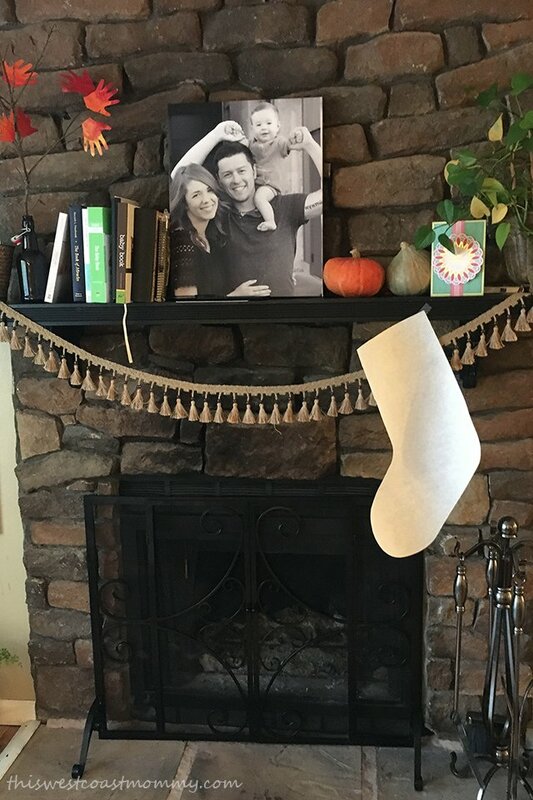 I suggest taping up your template wherever you plan on hanging your finished stockings to check the proportions and make adjustments if necessary. 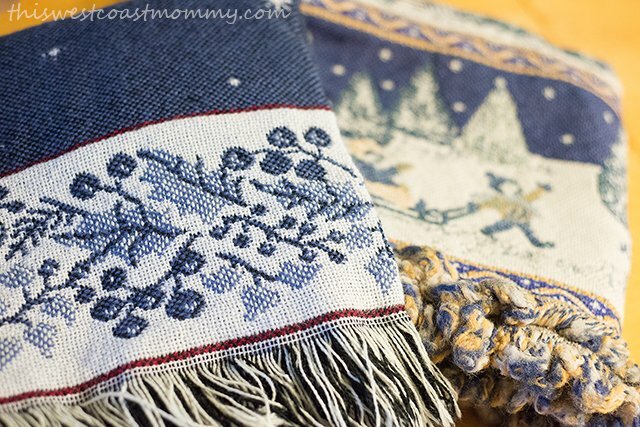 Step 2 – Lay out your woven blanket, and pick the image you want on the front of your stocking. Pin your template in place. There will be a 1/2” seam allowance. Cut out the front side. Step 3 – Pick the image you want on the back side of your stocking. 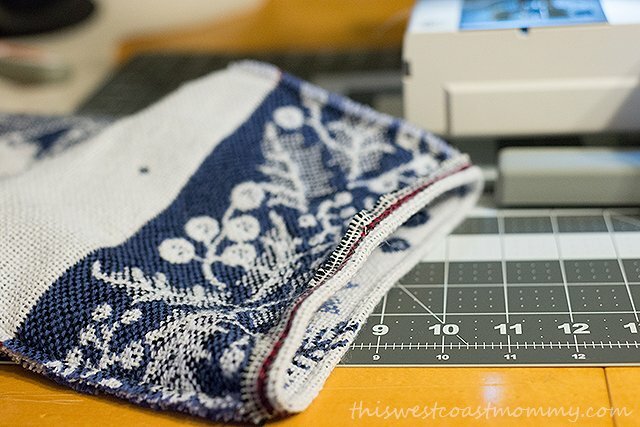 Remember to flip your template over so the stocking foot points in the opposite direction this time, otherwise the back of your stocking will show the reverse side of the blanket. Secure in place and cut out. *NOTE* I found that when I cut these blankets apart, they were made from several layers of woven yarn. I was nervous about so many layers slipping apart, so I repinned each side of my stocking immediately after removing the template. 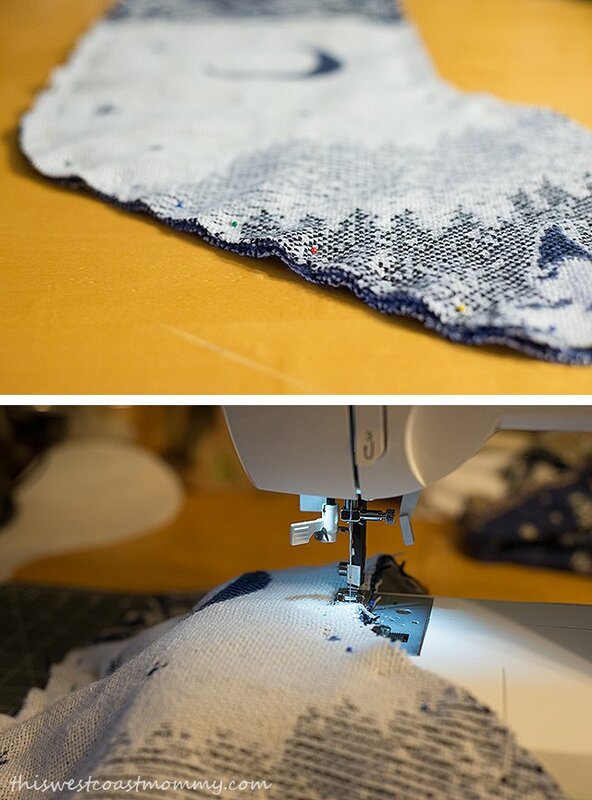 You may want to do the same if you’re working with multiple layers. Step 4 – Match up the two sides of the stocking and pin them with their right sides together. This is what your stocking will look like when it’s inside out. Sew all edges except the top with a 1/4” to 1/2” seam allowance. Step 5 – If you like the way the top of your stocking looks already, and it doesn’t need a cuff, fold the top down about a 1/4” all the way around and pin down. Stitch around the top for a nice finished edge. 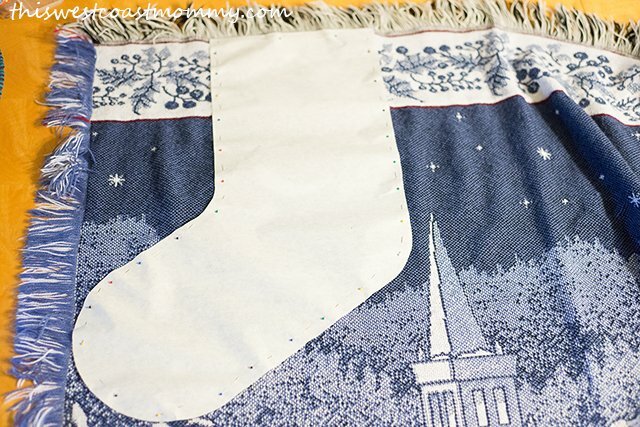 This first stocking I made came from a blanket with a beautiful holly and berries border that I didn’t want to cover up, so this one didn’t need a cuff. 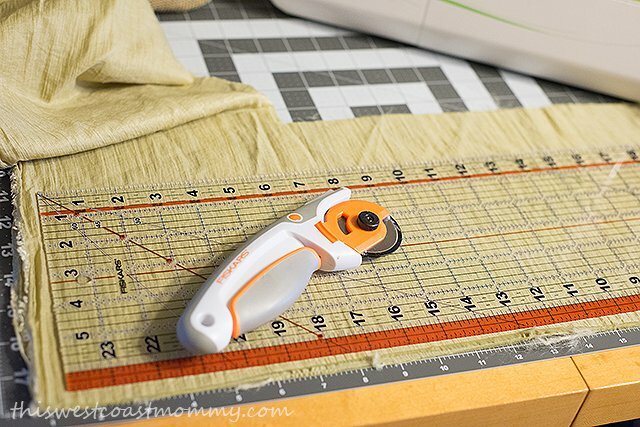 If you’re not making a cuff, skip down to step 6.
a) Cut a strip of coordinating fabric about 6 1/2” x 19 1/2”. 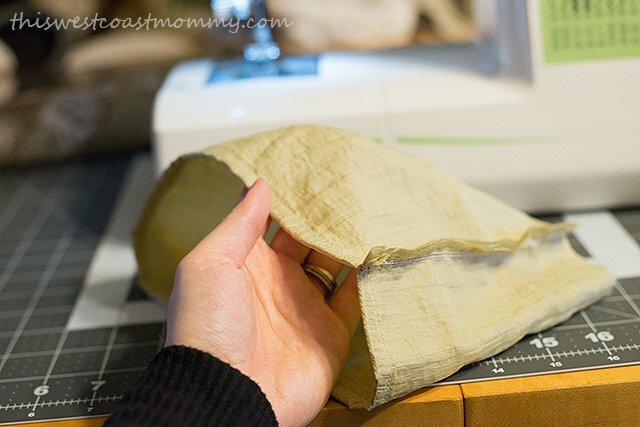 b) Pin down and sew a 1/4” seam along one of the long sides. c) Sew the two short sides together and flip the cuff right side out. d) While the stocking is still inside out, slide the cuff over the top of the stocking with the remaining unfinished edge of the cuff overlapping the stocking by about 1/2”. 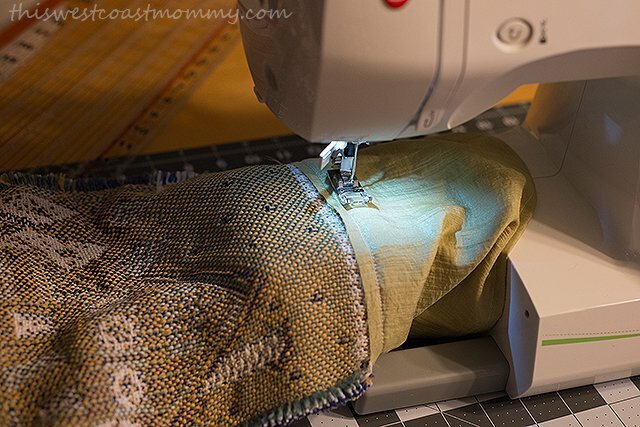 Rotate the cuff so that the side seam aligns with the edge of the stocking where you’ll attach your loop for hanging. e) Pin in place all around and stitch together with a 1/4” seam allowance. Step 6 – While the stocking is still inside out, pin your hanging loop to the correct side and stitch across several times. I didn’t measure my loops, but they look to be about 7”. 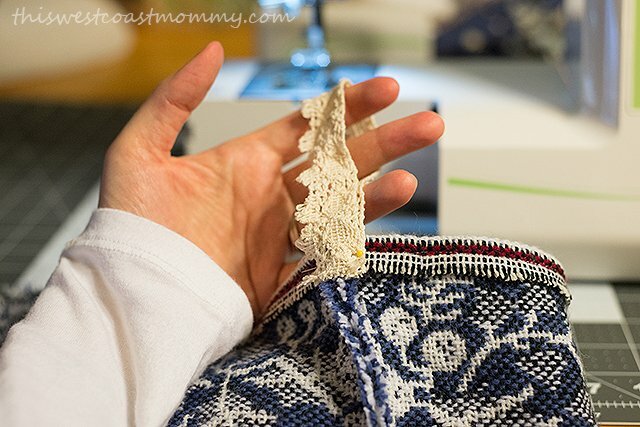 Step 7 – Turn stocking inside out, and if you have a cuff, fold it down in place. At this point you can hang it up as is, or you can embellish it by hot gluing trim and tassels to the top/cuff. Now your stockings are ready to hang—and fill! 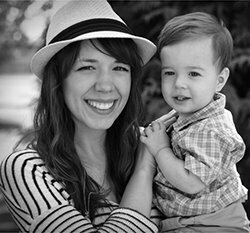 Samantha Levang is a contributor at This West Coast Mommy, specializing in cloth diaper and baby item reviews. She lives with her husband and one-year-old son in Washington state, and they look forward to welcoming a baby girl into the family this January. Between changing diapers and Braxton Hicks contractions, she enjoys landscape photography and the never-ending process of home decorating. 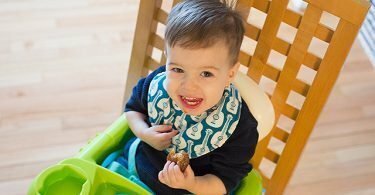 Öko Creations for Baby: Cute and Quality! Thank you! I didn’t have a whole lot of time for extra holiday crafts this year, so I just picked what was most important to me. I’m so glad they’re all finished, and now we get to enjoy them for years to come! Very nice repurposing of those thrift store blankets! I would love to make these and have matching ones, but we all use stockings that my mom made. Mine was made a long time ago and doesn’t look like the ones she made years later for my kids (her skills improved! ), but I’m obligated by sentiment to use it anyway. Great job! I know what you mean, wanting to stick with older handmade items for sentimental reasons. Who knows…maybe my kids will still be using these when they’re grown and have kids of their own! 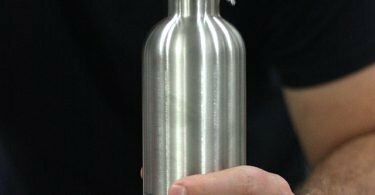 This is such a great idea, easy to do and something I never would have thought of. I love things that make use of items that would otherwise not be used and if it saves you some money, even better! 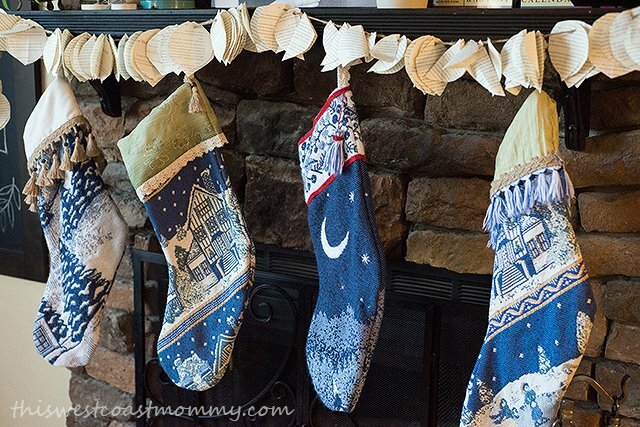 I love the idea but I would make mine with pointy toes (Tomte stocking). A “Tomte” is a Swedish elf associated with Christmas and winter. (My family is part Swedish.) Thanks for the clever idea. Those are awesome! And what a find, that woven blanket. I made our stockings from old blue jeans and decorated the front. I wish I had made them bigger as it’s hard to get all the goodness into them. They need their own chair instead of the mantle! I’ve thought about making my own stockings. Yours are so beautiful! And you make it look easy… which I know it isn’t lol. (at least not for me) Hope you and your family had a wonderful Christmas!! 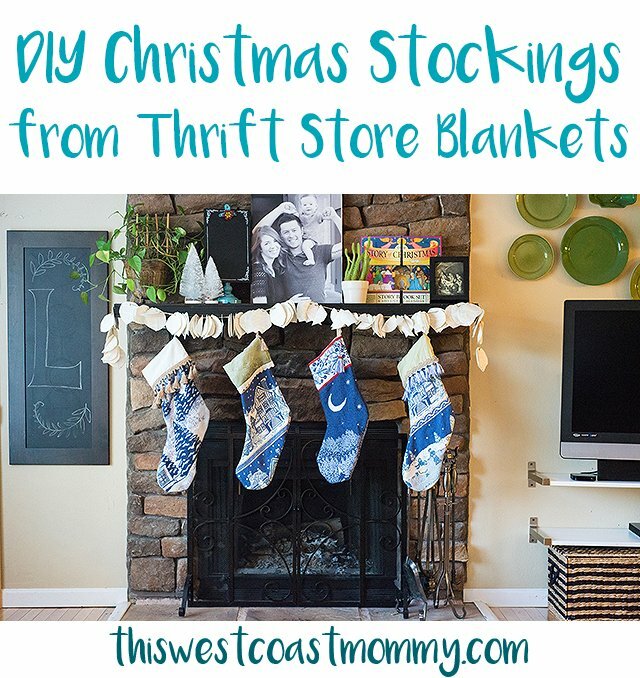 This is a wonderful idea and I love all the detailed instructions.I am going to try to make everyone a stocking for Christmas this year.